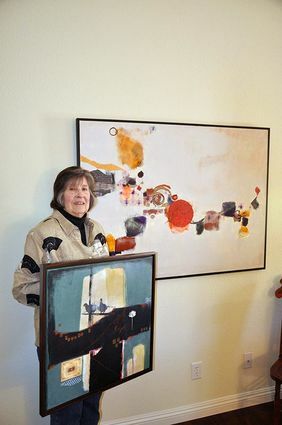 Arts Council Menifee chose artist Deborah Crafts [BS-Art ’59] as their Artist of the Month for March. Crafts grew up in Wisconsin and said she remembers knowing that she wanted to be an artist from the age of 12. As a youth, she enjoyed traditional drawing, but was interested in other mediums even then. To expand her artistic horizons, Crafts attended the University of Wisconsin in Madison, where she received a degree in art and later conducted graduate studies at Boston University. After completing her education, Crafts was ready to see the world, she said. She decided to move to Europe where she lived and worked for over two years. Crafts has held a variety of positions in several museums across the country. Her first official position was at The Mingei Museum in San Diego’s University Town Center. Other notable positions in Crafts’ career include director of development at the Balboa Park History Museum and at the Museum of Art and History in Santa Cruz.